In my last article, I explained the new approach in Django 2.0 to define URL patterns and specifically how to capture URL parameter. 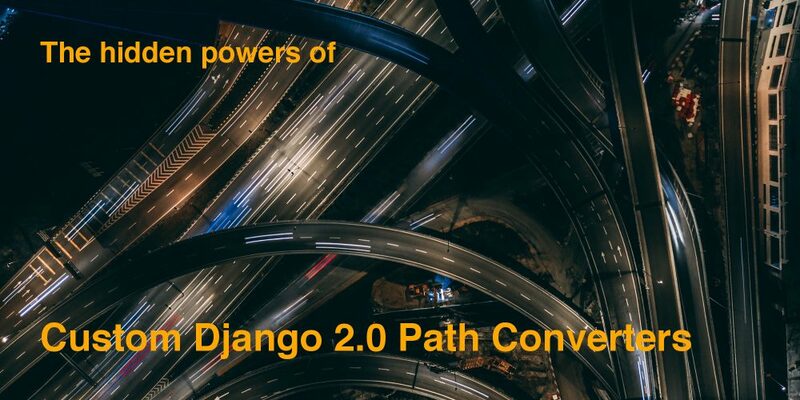 In this article, we will have a closer look at Django path converters, the bit you can optionally put before the colon in a URL parameter definition. Using the example above, the URL /posts/123/ would lead to the post_detail view being called with the keyword argument pk=123. 123 is an int here, not a str! Vice versa, when reversing a URL, you pass an int. It is worth noting that the type conversion is part of the URL matching process. If the conversion raises a ValueError, the URL does not match. This fact could be dismissed as a foot note, but it actually enables exciting new features! You could copy-and-paste this code in all of your projects, but to save you from that, I’ve polished this code a bit and published it on Github and PyPI. This wraps up our little excursion into the depths of Django 2.0 path converters. I always considered the URL matching one of the weakest parts of Django. In the past, I’ve worked with the Agavi framework, which has incredibly powerful URL matching mechanisms (although it is PHP and XML based), so I’m really excited about this new feature. Custom path converters have some limitations, that I don’t want to pass over. Path converters don’t have access to the current request, so you can’t do things like filter models by the current user. The model path converter I’ve shown you are not compatible with Django’s generic class-based views, at least not without overwriting their get_object() method. They are probably best suited for plain function based views. What is your opinion? Do you think this is a good idea? Worried you will forget everything you just read once you close this tab? 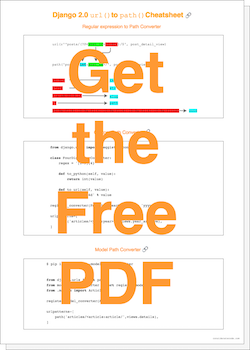 I've compiled a one-page cheat sheet with all the nitty-gritty details. Sign up to my mailing list and you'll get your cheat sheet right now, along with weekly updates on future topics.